Identified Flying Objects of secret military and terrestrial origin? In 2000, USAF issued a statement that "50%" of all UFO related phenomenons were caused by their top secret U2 aircraft. As a first step to investigate the correctness of this statement, this guided tour of the known or alleged secret aircrafts would be a good start. Even serious aeronautics magazines have sometimes published articles claiming that UFOs are WWII "German secret" unconventional aircraft. This is of course quite ridiculous. I hope that my documentation effort on unconventional aircraft can help anyone to differentiate again myths and reality about German WWII unconventional aircraft, as the USAF did as soon as 1949. Above:Walter Hortentesting a flying wing model, 1929. At this time, Reimar was still in school and Walter in the military; all the construction and testing was done on their spare time and own funding. The tests of the Ho I started in July 1933 at the Bonn-Hangelar airport. It glided from altitudes of 150 to 300 feet. The maximal gliding speed was estimated 228 km/h, and 170 km/h were actually reached. 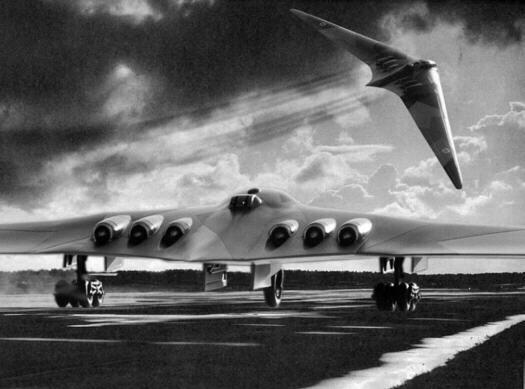 The glider had many stability problems; which the Horten brother tried to fix in-between tests. Above: The Hortensand some of their helpers with the Ho I. 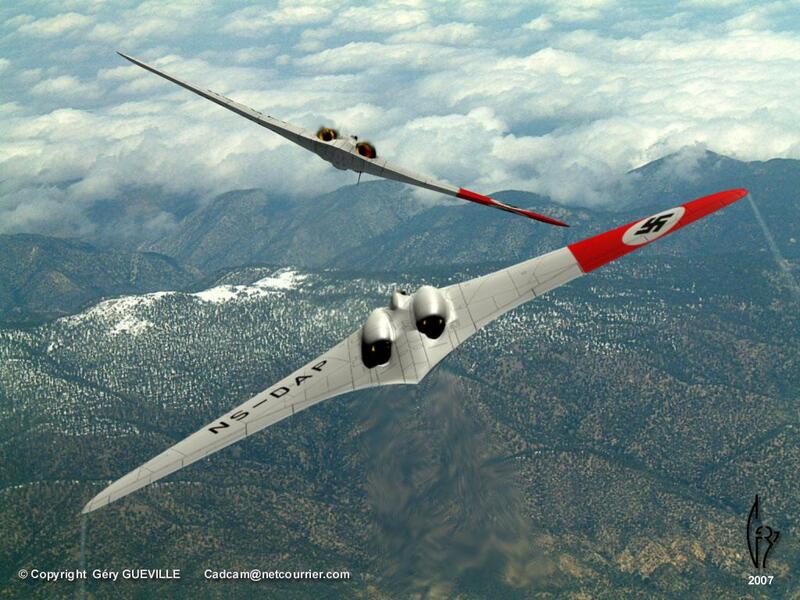 In a glider contest where the Ho 1 was confronted to better and more conventional gliders, the Ho 1 earned the Horten brother a "Construction Price" of DM 600, but no financial support was promised for their next project. A week later the glider school Director ordered Walter to retire from the competition and get rid of the Ho 1. Walter made one last "farewell" flight in the Ho 1, crashed it, then dismantled it, and burned it the following day. 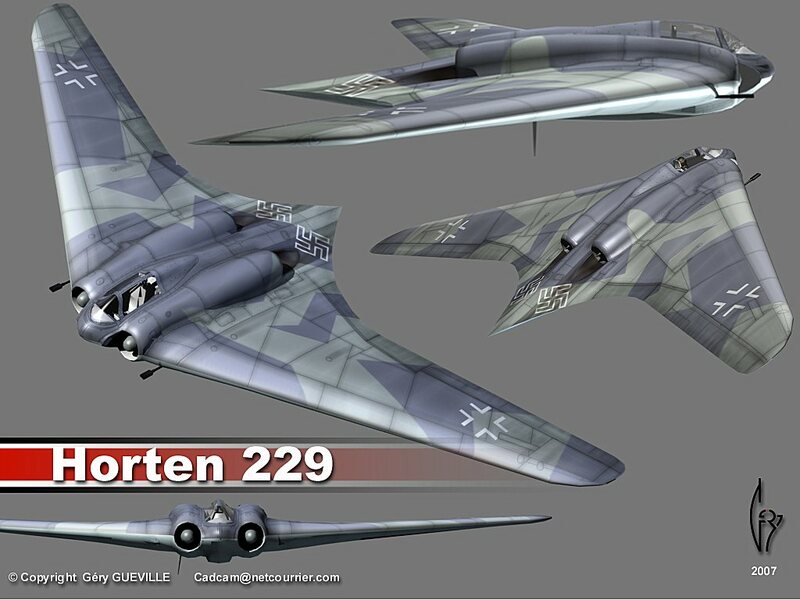 Also built in their home, the Horten brother's second design Ho 2l was ready after nine months. Three "l" subtypes were then constructed at Lippstadt, Germany, in 1937, and taken to the Bonn-Hangelar airport in May 1935. The pilot was in a reclining position, transparent panels were supposed to ensure visibility but they did poorly. Stability was much better than with Ho 1, although not all problems were solved. The brothers were able to borrow a 60 HP Hirth engine, and after a three month long modification program, they were able to take off an Ho 2m on their own. They had calculated that only 20 HP was needed for takeoff; the excess power of the Hirth engine allowed it to accelerate to 180 km by the time it reached the far end of the runway. The Ho II would climb to 3000 feet in two and a half minute. Gear operation:Only possible for long armed pilot's. Takeoff:Stick all the way back to break ground. Landing:Simple, with good glide path control. Stability:Difficult to assess, since the stick remains where it is put due to friction. Roll control:Unfriendly, some flutter in turbulence. Horten Ho 2 in NASM museum, California. Are UFOs aircraft of our own planet that are misinterpreted and confused for extraterrestrial spaceships? It has been 50 years that some have thought so, other thought that it is not so, while serious UFO researchers know that the answer resides somewhere "sometimes" and "often" but is not at all "always." It seems possible to me, with a little bit of homework, to examine each candidate plane individually and to assess if that plane is suitable or not as an explanation of the entire UFO enigma or of some UFO reports or of no UFO reports. Here is one of these case-by-case examinations. Boeing unveiled the Bird of Prey in a ceremony Friday, Oct. 18 in St. Louis. The Bird of Prey is a technology demonstrator that pioneered breakthrough low-observable technologies and revolutionized aircraft design, development and production. Developed by the Boeing Phantom Works advanced research-and-development organization, the Bird of Prey was among the first to initiate the use of large, single-piece composite structures; low-cost, disposable tooling; and 3-D virtual reality design and assembly processes to ensure the aircraft was affordable as well as high-performing. This project has been entirely financed by Boeing on its own funds, to a total cost of $67 million. It is only a technology demonstrator, the aircraft will not be used in a productive way, it will not be built large number. It is used to test new technologies, which, if they are efficient, will be used thereafter on other new aircraft. In the case of Bird of Prey, its construction technology is used for the X-45 UCAV (a pilotless aircraft). This aircraft's speed is subsonic, its engine is a conventional Pratt & Whitney JT15D-5C turbofan, which propels it at a speed of 260 knots and a maximal altitude of 20,000 feet. Its wingspan is 23 feet and its length 47 feet, it weighs up to 7,400 pounds. There were 38 test and demonstration flights of this plane. The first of these flights took place in autumn of 1996. Photograph of the plane when revealed in October 2002 © Boeing. Photograph of the plane on the tarmac in October 2002. The Bird of Prey as a UFO? As soon as the aircraft was introduced to the press in October 2002, some stated that UFOs are now explained. cannot disappear, nor bank or change flight path instantly, neither perform any of the manoeuvers that today's aeronautic physics considers "impossible." It is precisely the observation of such "impossible" behaviour that makes a truly puzzling UFO case. Serious ufologists know since the beginning of the research on the phenomenon that people can confuse aircraft and UFOs. They know that perhaps 80 to 95 percent of UFO reports, particularly those by unqualified witnesses, correspond to a vast collection of commonplace explanations, some including unusual or little known aircraft. They even know that the majority of the witnesses who observe a strange aerial phenomenon first think, when the sighting begins, that what they see must be some more or less strange and secret aircraft, and that it is only later in the sighting, when the supposed aircraft gets closer, or performs flight manoeuvers that modern physics considers impossible, or when the phenomenon lands, and sometimes when its occupants are seen, that the witness is forced to accept that what he observes is not an aircraft, even innovative. Even better, there are UFO reports for which it is only much later than the witnesses understood that what they saw could not have been "the rumoured new secret aircraft," or "something the Russians built." When the referred to new secret aircraft is actually revealed, sometimes years later, it becomes certain that the new secret aircraft is very below what they had observed. To claim, each time that a new aircraft is announced, i.e. indeed several times every year for the last 50 years, that the UFO phenomenon has found its explanation, is simply an ignorant claim, ignorant of the data of the UFO problem, and even often ignorant of aeronautics data. Indeed, the Bird of Prey is not particularly suitable as explanation of those UFO observations that are truly puzzling, unless the witness observed a UFO between 1996 and today, on a flight test area used by Boeing and was not qualified enough or lucid enough to realize that what he sees is a plane. I have once again noted that as soon as Boeing revealed the Bird of Prey, many amateurs and also media sources uneducated about the UFO phenomenon and normally not involved at all in any UFO research effort have claimed that UFOs are explained. In particular, I have already seen suggestion that this 1996-born aircraft is the cause of the huge UFO flap over Belgium in 1989-1990. As normally these sources of information (aeronautics magazine and web sites, space news web sites, astronomy web sites) do not say anything at all about UFO reports and research, which is absolutely not their subject, I wonder whether a sociological fact is involved here: does the idea that the UFOS can exist distress so many people or groups that "do not believe in flying saucer nonsense," that they feel compelled to go "off topics" in their publications so as to reassure themselves about the inexistence of the UFOS? Do they do that to promote themselves as "the serious people" as opposed to the "ET/UFO believers?" Are UFOs extraordinary secret aircraft from our own planet that are misinterpreted and confused for extraterrestrial spaceships? It has been 60 years now that some have claimed so, while serious UFO researchers know that a very ordinary airliner suffice to create a UFO confusion. And after 60 years, absolutely none of the so-called secret earthly aircraft has ever revealed anything out of the normal improvement of aviation technology. It seems possible to me, with a little bit of homework, to examine each candidate plane individually and to assess if that plane is suitable or not as an explanation of the entire UFO enigma or of some UFO sighting reports or of no UFO sighting reports. Here is one of these case by case examinations. X-47A, nicknamed "Pegasus" is constructed by Northrop-Grumman on their own funding, with the support of the US Defence's DARPA (Defence Advanced Research Project Agency) and US Navy. Its most unusual characteristic is that of being an unmanned combat aircraft (UCAV) which is clearly meant for attack purpose, that is, destroying the enemy's air defense, not just for reconnaissance purpose. It is tailless and kite-shaped. The lack of tail and rudders explains quite well: there is no pilot, its pitch roll and yaw is entirely controlled by its informatics using flexible parts of its entire flight envelope: maneuvers via six control surfaces: two elevons and four inlays, inspired by Northrop's flying wings of the fifties, two above and two below the fuselage, and a two-dimensional nozzle. X-47 explains zero UFO reports before February 2003. On February 26, 2001, Northrop Grumman Corporation's Integrated Systems Sector presented a full-scale model of the X-47A demonstrator. The model had undergone 500 hours of wind tunnel testing and 300 hours of computer simulations. Its first flight was on February 23, 2003, at the Naval Air Warfare, China Lake, California, USA. It was a successful 12 minutes flight which consisted essentially of a simulated aircraft carrier landing. The aircraft was supposed to land at a precise predetermined touchdown point, and this test was successful. This first flight was widely announced by Northrop-Grumman, as were the previous tests of autonomous engine start and stop. Although the aircraft technical achievements details are certainly not public domain, its existence is nothing of a secret. Drawing of its shape circulated already two years before its first flight. A mockup model is on public display at the Naval Air Station Patuxent River, Maryland. You may read all sorts of more or less nonsensical claims about this aircraft: that is is using antigravity, or magnetohydrodynamics, and probably some will claim that it is inspired by "alien technology." Although it seems impossible to prove that it is all nonsense, such speculations are empty: the aircraft is entirely in the range of today's aeronautics, and it shows no sign of any unusual propulsion. Engine:Pratt & Whitney JT15D-5C turbofan. Role:Surveillance, strike and suppression of enemy air defences. Aviation Week & Space Technology, 19 February 2001. "'This was a secret project, a highly secretive project, behind screened doors, with security guards that protected this,' according to Zuk. Some research indicates the Avrocar project was cancelled after flight stability problems could not be overcome." -CNN News Online, April 11, 2000. What truth is there in these claims? The concept was by an English aeronautical engineer John Frost, aged 31, who had left de Havilland in England because the economic context did not allow to risk any money in unorthodox designs. His latest realization was the de Havilland 108, a quite unconventionnal yet successful plane. In Canada, after having been bored with the development of the very conventional EC 100 jet fighter, he thought about those widely reported "Russian or Martian" flying saucers and in 1953 he proposed to design Canadian flying saucer, baptized Avrocar. Later, in 1960, advertising booklets were prepared by Avro, announcing not only the Avrocar revolution, but also an Avrowagon for the whole family, an Avroangel as flying ambulance, an Avropelican for rescue mssions etc. Avro's intention was to massively distribute these booklets to potential customers, civil and military. Unfortunately the Avrocar which was intended to be "supersonic," proved with its first "flight" in 1960 to have the performances and the maneuverability of a hovercraft without skirts: crashing to the ground at every reasonable manoeuver attempt, and not rising more than 2 and a half meters, totally unpredictable as soon as the flow of its turbine did not benefit anymore from ground effects. In addition, the structure had an annoying tendency to quickly melt in its overheated center. And of course, the surrealistic goal of a Mach III speed was long gone. This is why these booklets were never distributed, which barely qualifies as "a secrecy firmly maintained for 50 years." There was actually no lasting secret about the Avrocar, as a quick tour of the Press indicates. A soon as 1954, numerous frontpage articles discussed the Avrocar fiasco, and the public concern over budgets wasted in the inefficient concept which never flew. Above is the center of the frontpage of The Leader Post, Regina, Saskatchevan, Canada, December 3, 1954. Canadian defense confirms to the Press that canada attempted to build a flying saucer but gave up because the investiment revealed unjustified. The minister of Defense and Trade discusses the matter in an interview in a foreign country. Only a tiny fraction of the budget was necessary to understand that it can only be a fiasco. Canada proved itself that it could fly, but it never flew, it never left the ground, and the minister thinks that no other country has ever built a successful flying saucer. It is possible to imagine that the Secretary for Trade lied (but for what purpose? ), but it is intolerable to say that the Canadian project had been so secret that it took 50 years to learn its the existence. This was a local newspaper, but the similar article appeared elsewhere, for example in the Toronto Star. In June 1955, the American "Look" magazine published a long article. Brigadier General Benjamin Kelsey, deputy manager of the US Air Force research and development, revealed the invaluable secrecy: the Air Force will study a project of a flying saucer. He gives great details about the expected performances and a faithful description of the Avrocar, without mentionning the project's name because that was not the point. On September 15, 1953, the New York Times published an article about the visit of Lieutenant-Gen. Donald Putt of the US ARDC at the Avro plant in Malton, and its favorable impression about the "Project Y," the first model of for the Avrocar. In 1959 a private pilot, Jack Judges, flies above the Avro plant, sees and takes pictures of the Avrocar prototype, and the photograph is published in the newspapers, who speculate that this "secret weapon" explains the flying saucers. US Air Force provides better photographs of Avrocar to the press, The newspapers publish these better photographs and the presentation of the project by US Air Force. 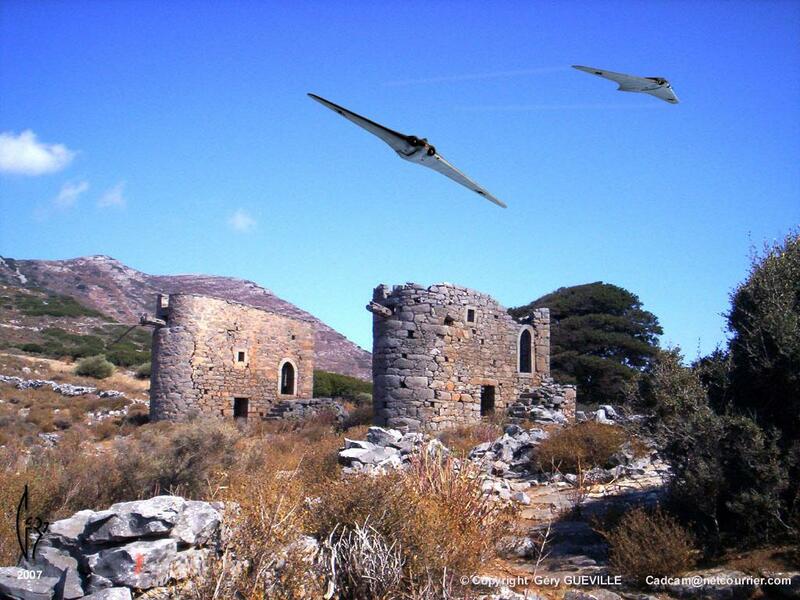 According to skeptics, the Avrocar project has then been undertaken by the Americans under the code name of Silverbug, and in absolute secrecy they had made a success of this development and the flying saucers reported all around the world since 50 years are really Silverbugs, or at least the McMinnville photographs show a Silverbug, and we would have learned that only 50 years later because of the secrecy. There is also no great concern in the skeptic community that the machine that could not really fly in the first tests in 1961 would hardly cross the skies of Oregon ten years before. The secrecy in question is merely the fact that in the first months of development in 1953, the team kept their work secret. Very quickly, rumours circulated at Avro that a flying saucer was under construction, and everyone joked on the secret super project, doubting its existence. But before the end of the first year, the official Avro photographer had the privilege to gasp at the silvery prototype, when he was asked to take pictures for the next release of the Avro catalogue. So secret was the project that Thomas Turner, a British aeronautical engineer at Republic Aviation Corporation showed up at Avro in 1955 because he thought he might help by explaining the interest of the "Coanda effect," a somehow mystifying name for what is merely the possibility to direct a jet exhaust using flaps. He heard of the super cosmic secret Avro project in the newspapers. From 1955 to 1960, Frost and Ernie Happe, another British engineer, work at the stability problem with the prototype suspended under several tethers, and in 1960 that the first true flight test takes place, with the former pilot of the Polish air forces Spud Potocki, at Avro Canada. The machine was maitained by cables at the beginning of these tests, but after a few months of training, Potocki had ended up acquiring the necessary skill and had great fun to fly the machine between the hangars and the offices of Avro, always at 2.5 meters of altitude and quite far from crossing the sound barrier. Frost seemed to have understood certain realities, and explained wthat giant troop transport Avrocars should be now studied. Changing what was to be a supersonic flying saucer reaching altitudes conventional jet aricraft could not reach lead to a machine that was merely a first hovercraft, such that that can see or borrow the tourists crossing the English Channel, except that it was not even viable as hovercraft. It is at this time that Avro started to carry out its booklets about the Avrowagon, Avroangel and other Avropelican. When USAF suggested to add a tail so that the machine could be manoeuverable, Frost, uncompromising about the aesthetic purity of his design, entered in such a rage for anotherwise flegmatic gentlemen that US Air Force did not dare to insist. Initially allured, American had initially taken a face value the announced fantastic performances (Mach 1.5, then Mach 3 were quoted), but later in 1961 when the machine was first flight-tested they realized that it would never even reach the performance of the Wrights brothers aeroplane, and stopped Project Silverbug, that is, their financial support of the Avrocar development. Their initial interest in 1952 was that they wondered if flying saucers could be human aircraft, and after a failure to find any trace of any human built flying saucer anywhere, the notion that the Avro company may soon have one was created a temptation they understandably could not resist. They had to be in it, anyway, ... and it was even urgent. But in 1961, having noted the real performances and the problems inherent to the concept, after having invested $7.5 million, USAF gave up. Naturally, the budget invested in this unsucessful project - and the perspectives of mockery and criticism by the Press - justified at this time a certain discretion on behalf of the Americans. Other much more promising research was in hand American side, which led to real flying machines, whose significant common characteristic was they they did not have a discoïdal shape. The two existing specimens of the Avrocar were shown in various museums over time, such as the national Air and Space Museum in 1975, and even on the occasion publicly presented or quoted by USAF official as proof that the UFOs cannot exist, since the Avrocar is the "unquestionable" proof that discus shaped objects can't fly. Skeptics, for example the CSICOP, continues to insist upon Silverbug as the explanation for the McMinnville photographs, in spite of the obvious differences in shape, the chronological problem, the inability of the Avrocar to fly higher than 2 and a half meters and no faster than a bicycle, only at the Avro plant, only durin a few months in 1961, only a few hundred meters trips. Others tell us that the concept actually comes from "Nazi scientists," I believe that if one names the unfortunate Mr. Frost to these people, they would just wonder who that would be. What are the original sources for these allegations? Some conspiration theory web sites? Admittedly, but who started the Nazi Silverbug and US fling saucers myth? "Recently declassified papers show that Avro was working on a range of flying saucers capable of eclipsing existing jet-fighters. And the US air force had bought Avro's disc-shaped designs for craft called Project Silverbug, capable of almost instant high-speed turns in any direction." "LONDON (Reuters) - The U.S. military may have conducted serious research into anti-gravity based on Nazi studies, a top defense journalist suggests in a new book. "'I feel intuitively that some vehicle has been developed, particularly given that there is this wealth of scientific data out there, and the Americans have never been slow to pick up on this sort of science,'" Cook, the aerospace consultant for Jane's Defense Weekly, told Reuters in an interview." The intuitions were that Nazis built flying saucers, in Poland this time, and Silverbug was the continuation of the Nazi efforts, thanks to Nazi scientists captured by the US, and the Stealth aircraft are propelled by antigravitics, and all that explains the UFOs, and the "proof" is in the declassified papers, "after 50 years of secrecy," theose papers that practically nobody in the media cared to read. All this made the commercial success of plethoras of books, "fascinating" but "serious" books, since they prove the Nazis not the extraterrestrial haunt our skies. "There is still no firm evidence that electrogravitics is more than science fiction. Civilian scientists and amateurs have experimented with it, and while some have reported success, no one seems to have reproduced their results to prove that it works." Quant de rares sceptiques qui ont bien voulu admettre que l'Avrocar/Silverbug n'était pas un candidat admissible pour expliquer les OVNIS, ils nous proposent ensuite qu'en réalité, l'Avrocar alias Silverbug n'était qu'une façade pour dissimuler les "vraies" soucoupes volantes US volant à Mach III dès 1952, à savoir, les projets Y puis Y2 ...lesquels Y et Y2 étaient en fait les noms de codes Canadiens pour les deux prototypes Avrocar et Silverbug. As a tiny number among skeptics agreed that Avrocar/Silverbug was not an acceptable candidate to explain UFOs, come of them then proposed that what we know about Avrocar and Silverbug is "only a cover-up" for the "the real" US flying saucers flying at Mach III since 1952, namely, Projects Y and later Y2... The Y and Y2 were in fact the Canadian code names for the two prototypes Avrocar and Silverbug. Of course, no sides has a monopoly on errors, such as this one: the picture underneath is shown here and there with the comment that "this photograph is irrefutable proof that the United States captured extraterrestrial spaceships, stored in the infamous Hangar 18:"
With the Avrocar/Silverbug fiasco, engineers soon learned that there were major difficulties understanding how a saucer shaped craft may move within our atmosphere. Flyinf saucers, existing or not, certainly cannot use the same propulsion or lifting technology as either our jet aircraft or rockets. Fifty years alter, we have Harrier and Sukhoi and other VTOL aircraft, and some circular drones with a central propeller are beginning to be flown, undoubtedly mistaken for extraterrestrial aircraft on the occasion, but we still do not have a decent supersonic flying saucer of terrestrial origin. Finally we see that the overwhelming desire to prove that flying saucers cannot be extraterrestrial can involve to considerable historical misconceptions, which are generally not seen because of collective amnesia. Newspaper article in The Toronto Star, February 11, 1953, Canada. Newspaper article in The New York Times, September 15, 1953, USA. Newspaper article in The Leader Post, December 3, 1954, Canada. Look Magazine, Volume 19, Article & Illustrations, June 14, 1955, USA. "The Canadian AVRO flying saucer - and the german flying saucer technology," newspaper article in The Guardian, September 9, 1999, UK. "Revealed: Britain's flying saucer of the 50s," newspaper article in The Sunday Times, by Jonathan Leake, Science Editor, March 26, 2000, UK. This aircraft, the LoFlyte, is experimental, and because is is an attempt to build an hypersonic jet, it was used by some "skeptics" to dismiss various UFO reports, even over foreign countries such as Belgium, where triangular shaped UFOs were sighted. But, as you will see, there is a little problem about the LoFlyte that makes it impossible to use it as "the explanation" for UFO reports. The incredible LoFlyte hypersonic aircraft looks like a good candidate to explain some of the triangular shaped large UFOs spotted all around the world... So said the French press when an historical UFO flap occured in Belgium in 1989-90. But ... there might be a set of problems! Yes indeed, the LoFlyte is a small remote controlled craft, and has nothing to compare with the large dark triangular objects with lights at their corner and in the middle... The Loflyte cannot hover, it cannot stay stationary, or fly at the speed of a bicycle, it has no lights, and, of course it flew only in the US in few occasions. After the unveiling, Topher Kersting, Marketing Coordinator for Accurate Automation Corporation, a prime contractor for the joint NASA and US Air Force project, confirmed: "The next version, pending the successful completion of the forthcoming flight test, is intended to be a 23ft (7m) unmanned remotely piloted vehicle capable of hypersonic flight. What is beyond that is anybody's guess." Kersting also confirmed that the photograph released by Accurate Automation Corporation was a computer generated Photoshop(TM) composite, created by a colleague and himself. "Just because you see a picture on a cloud background doesn't mean that the plane has flown," he cautioned. One last thing: the LoFlyte model first flew in 1995. The U-2 provides continuous day and night, high-altitude, all-weather surveillance and reconnaissance in direct support of U.S. and allied ground and air forces. It provides critical intelligence to decision makers through all phases of conflict, including peacetime indications and warnings, crises, low-intensity conflict and large-scale hostilities. The U-2S is a single-seat, single-engine, high-altitude, surveillance and reconnaissance aircraft. Long, narrow, straight wings give the U-2 glider-like characteristics and allow it to lift heavy sensor payloads to unmatched high altitudes quickly, and keep them there for a long time. The U-2 is capable of collecting multi-sensor photo, electro-optic, infrared and radar imagery, as well as collecting signals intelligence data. It can down link all data, except photo imagery, in near real-time to anywhere in the world, providing war planners with the latest intelligence possible. The U-2 has one of the highest mission completion rates in the U.S. Air Force despite the fact that the aircraft us the most difficult to fly due to its unusually challenging takoff and landing characteristics. Due to its high-altitude mission, the pilot must wear a full pressure suit. The aircraft has a General Electric F-118-101 engine that is fuel efficient and lightweight -- negating the need for air refueling on long duration missions. The fleet is undergoing an entire rewire effort to lower its overall electronic noise signature and allow a quieter platform for the newest generation of sensors. The sensors are also in a state of constant upgrades. The cockpit is being redesigned to replace the 1960s vintage round dial gauges with multifunction displays and complete "glass cockpit" technology. Current models are derived from the original version that made its first flight in August 1955. On Oct. 14, 1962, the U-2 photographed the Soviet military installing offensive missiles in Cuba. It provided critical intelligence data during all phases of operations Desert Storm and Allied Force. The U-2 provides daily peacetime indications and warning intelligence collection from its current operating locations around the world. When requested from the Federal Emergency Management Agency, the U-2 has also provided peacetime reconnaissance data in support of disaster relief from floods, earthquakes and forest fires, and has been used as a search and rescue asset on several occasions. The U-2R, first flown in 1967, was 40 percent larger and more capable than the original aircraft. A tactical reconnaissance version, the TR-1A, first flew in August 1981 and was delivered to the Air Force the next month. Designed for standoff tactical reconnaissance in Europe, the TR-1 was structurally identical to the U-2R. Operational TR-1A's were used by the 17th Reconnaissance Wing, Royal Air Force Station, Alconbury, England, starting in February 1983. The last U-2 and TR-1 aircraft were delivered to the Air Force in October 1989. In 1992 all TR-1s and U-2s were designated U-2Rs. All U-2R models have since completed engine replacement and are designated as a U-2S/TU-2S. U-2s are based at the 9th Reconnaissance Wing, Beale Air Force Base, Calif., and support national and tactical collection requirements from various operational detachments located worldwide. U-2 crewmembers are trained at Beale using four two-seat model aircraft (designated TU-2S). The F-117A Nighthawk is the world's first operational aircraft designed to exploit low-observable stealth technology. The unique design of the single-seat F-117A provides exceptional combat capabilities. About the size of an F-15 Eagle, the twin-engine aircraft is powered by two General Electric F404 turbofan engines and has quadruple redundant fly-by-wire flight controls. Air refuelable, it supports worldwide commitments and adds to the deterrent strength of the U.S. military forces. The F-117A can employ a variety of weapons and is equipped with sophisticated navigation and attack systems integrated into a state-of-the-art digital avionics suite that increases mission effectiveness and reduces pilot workload. Detailed planning for missions into highly defended target areas is accomplished by an automated mission planning system developed, specifically, to take advantage of the unique capabilities of the F-117A. The first stealth fighters were flown by Lockheed C-5 Galaxy cargo plane to Groom Dry Lake, where they took to the air for the first time in June 1981. Security was of a very extreme nature. Unauthorized ground personnel were required to remain indoors when a stealth jet emerged from its hangar. Test flights were made mostly at night, their schedule arranged to avoid overflights by Soviet reconnaissance satellites. The Nellis Range is also home to the Air Force's "Red Flag" air combat exercises, which involve aircraft and pilots of American and several foreign military aviation services. Those other aircraft were kept away from the Groom area by an airborne screen of security aircraft. Despite the F-117A's 33 percent increase in physical size over the prototype, the stealth fighter's RCS measured between .01 and .001 square meters - about that of a small bird. For instance, compared to a McDonnell Douglas F-4G Phantom typically used for "Wild Weasel" anti-radar missions, which has a head-on RCS of 6 meters, the F-117 was able to get 90 percent closer to ground-based search radars, and 98 percent closer to airborne radars, before being detected. The first F-117A was delivered in 1982. The F-117A production decision was made in 1978 with a contract awarded to Lockheed Advanced Development Projects, the "Skunk Works," in Burbank, California. The first flight was in 1981, only 31 months after the full-scale development decision. Air Combat Command's only F-117A unit, the 4450th Tactical Group, (now the 49th Fighter Wing, Holloman Air Force Base, N.M.), achieved operational capability in October 1983. Having outgrown the Groom Lake facilities, the stealth unit operates out of the remote Tonopah Test Range airfield in the northwest corner of the Nellis Range. Although overlooked by public land, the Tonopah facility is 40 desert miles from the nearest town. Streamlined management by Aeronautical Systems Center, Wright-Patterson AFB, Ohio, combined breakthrough stealth technology with concurrent development and production to rapidly field the aircraft. The F-117A program has demonstrated that a stealth aircraft can be designed for reliability and maintainability. The aircraft maintenance statistics are comparable to other tactical fighters of similar complexity. Logistically supported by Sacramento Air Logistics Center, McClellan AFB, California, the F-117A is kept at the forefront of technology through a planned weapon system improvement program located at USAF Plant 42 at Palmdale, California. It has also been noted that the F-117A contains experimental propulsion technology possibly being electro-gravitic systems. Late in the year of 1954, the National Advisory Committee for Aeronautics (NACA) issued a requirement for an air-launched manned research vehicle with a maximum speed of more than Mach 6 and a maximum altitude of more than fifty miles. North American Aviation Incorporated was awarded the contract for the new research vehicle, the X-15. "I don't feel like speculating about them. All I know is what appeared on the film which was developed after the flight." Developed under USAF Project MX-1226, three X-15s were built and together made 199 flights during a research program which lasted from 1959 to 1968, exceeding all speed and altitude goals set. The X-15 was designed to fly at speeds of Mach 6 and altitudes up to 250,000 feet. 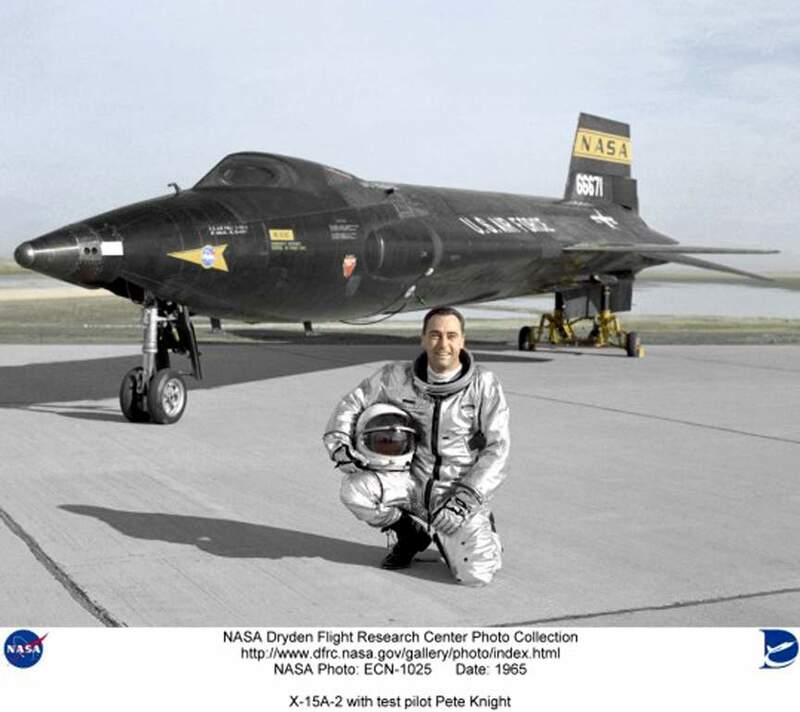 The aircraft went on to reach a maximum speed of Mach 6.7 and a maximum altitude of 354,200 feet. Mach 6 is about one mile per second and flight above 265,000 feet qualifies an Air Force pilot as an astronaut. The X-15 made its public appearance on 15 October 1958 at North American's Los Angeles facility and the first of the three X-15s arrived at Edwards AFB two days later. On 10 March 1959, with project pilot A. Scott Crossfield at the controls, the X-15 made its first captive-carry flight under the right wing of a B-52 carrier aircraft. On 8 June 1959, it made its first glide flight, reaching a speed of 522mph (Mach 0.79) from a release altitude of 52,341 feet. During a test flight, the X-15 would be air-launched by NASA's converted B-52 at an altitude of 45,000 feet and a speed of 500 mph. Generally, there were two types of flight profiles: high-speed or high-altitude. High-speed flights were usually conducted below an altitude of 100,000 feet and flown as a conventional airplane using aerodynamic controls. High-altitude flights began with a steep, full-power climb to leave the atmosphere. This was followed by up to two minutes of "coasting up" to peak altitude after the engine was shut down. High-altitude flights usually lasted for 2-5 minutes as it made a ballistic arc before reentering the atmosphere. A reaction control system, employing hydrogen peroxide thrusters located on the nose and wings, was used to maintain attitude above the atmosphere. A typical research flight lasted about 10 or 11 minutes while covering nearly 400 miles along a course that stretched from Smith Ranch, Nevada to Edwards Air Force Base. First use of a full-pressure suit for spaceflight. First use of reaction controls for maneuvering in space. First use of a flight control system that automatically blended aerodynamic and reaction controls. Development of thermal protection for hypersonic reentry. Development of the first large, restartable, and throttleable rocket engine. Development of an inertial guidance system. Demonstration of a pilot's ability to operate in "micro-gravity". Demonstration of the first piloted reentry-to-landing from space. Acquisition of hypersonic acoustic measurements, which influenced structural design criteria for Mercury capsule. Verification of the validity of hypersonic wind tunnel data, which were later used in the design of the Space Shuttle. The U.S. Air Force/Northrop Grumman B-2 Spirit stealth bomber is a strategic, long-range heavy bomber. Its low-observable stealth technology and all-altitude operational envelope gave it the capability to penetrate the most sophisticated air defenses. 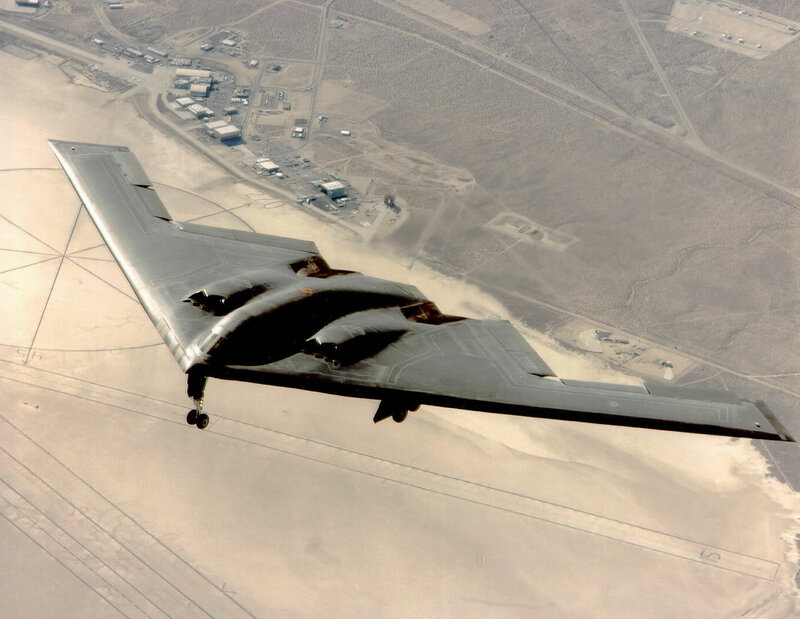 After being developed under a blanket of secrecy, the high-tech B-2 Stealth bomber was unveiled at the Northrop company's manufacturing plant in Palmdale, California, on 22 November 1988. An audience of invited guests and journalists was kept well away from the plane that was designed to slip through enemy radar defenses without being detected and then drop up to 16 nuclear bombs on key targets. Its first flight was July 17, 1989. The B-2 Combined Test Force located at Air Force Flight Test Center, part of Edwards Air Force Base, California, is responsible for the engineering, manufacturing and flight testing of the development aircraft as they are produced. The prime contractor, responsible for overall system design and integration, is Northrop Grumman's Military Aircraft Systems Division. Boeing Military Airplanes Co., Hughes Radar Systems Group and General Electric Aircraft Engine Group are key members of the aircraft contractor team. Another major contractor, responsible for aircrew training devices (weapon system trainer and mission trainer) is Hughes Training Inc. (HTI) - Link Division, formerly known as CAE - Link Flight Simulation Corp. Northrop Grumman and its major subcontractor HTI, are responsible for developing and integrating all aircrew and maintenance training programs. To help achieve radar invisibility, the bomber is coated with radar-absorbent paint on its leading edge. A similar technology is used underwater to foil sonar detection. Modern submarines are coated in a thick layer of a top-secret resin which is highly absorbent acoustically, and reflects only a minute amount of the energy transmitted by sonar detectors. The B-2's low-observability means that it does not need an armada of support aircraft to accomplish a mission, and its large payload allows it to do the work of many smaller attack aircraft. The revolutionary blending of low-observable technologies with high aerodynamic efficiency and large payload gives the B-2 important advantages over existing bombers. Its low-observability provides it greater freedom of action at high altitudes, thus increasing its range and a better field of view for the aircraft's sensors. The Air Force has published a representative mission scenario showing that two B-2's armed with precision weapons can do the job of a package of 75 conventional aircraft. Only four crew members are put at risk in this mission, compared to 132 in the conventional aircraft package. The B-2's low-observability is derived from a combination of reduced infra-red, acoustic, electromagnetic, visual and radar signatures. These signatures make it difficult for sophisticated defensive systems to detect, track and engage the B-2. Many aspects of the low-observability process remain classified; however, the B-2's composite materials, special coatings and flying-wing design all contribute to its "stealthiness." The B-2 can fly more than 6,000 nautical miles unrefueled and more than 10,000 nautical miles with just one refueling, giving it the ability to fly to any point on the globe within hours. Whiteman AFB, Missouri, is the B-2's only operational base. The first aircraft, Spirit of Missouri, was delivered on 17 December 1993. Depot maintenance responsibility for the B-2 is performed by Air Force contractor support and is managed at the Oklahoma City Air Logistics Center at Tinker AFB, Oklahoma. Tests show that with its low observable characteristics, the B-2 is the most survivable aircraft in the world. Northrop Grumman Corporation, the prime contractor, produces the B-2 at facilities in Pico Rivera and Palmdale, California. (*) In reality this Colonel never said that publicly. It is only a claim by the infamous "Dr. Wolf" who said this Colonel told him that privately. It is also worthy to note that the Selected Acquisition Report (with which United States lawmakers track the cost of major U.S. weapons projects) valued the B-2 program at $45 billion. With 21 aircraft built, that works out at $2.14 billion each, twice the cost as stated above. After taking off conventionally, the B-2 has the option of switching to anti-gravity mode. It has been said that using its anti-gravitic technology, the B-2 can fly around the world without refueling. The F-117 stealth fighter also has hybrid propulsion and lift technologies which may be electro-gravitic systems. Utilizing conventional thrust for public take-offs and landings, switching to anti-gravity mode would allow an extended cruising range, lightning fast maneouverability, and for shrouding the airframe in invisibility (by having its local counter-gravity field bend light around the airframe). How are anti-gravity systems controlled? It has been known for sometime now by "Black World" technologists that the key to controlling gravity is Element 115 on the Periodic Table - Ununpentium. The most important attribute of this heavier, stable element is that the gravity A wave is so abundant that it actually extends past the perimeter of the atom. These heavier, stable elements literally have allegedly their own gravity A field around them, in addition to the gravity B field that is native to all matter. By controlling the gravity A wave, you can control gravity. By fuelling an aircraft reactor with ununpentium, you have an aircraft capable of using anti-gravity propulsion. Its unit cost is currently estimated to range between 800 and 1300 million dollars, depending on the sources. The unit cost indicated by the US Air Force is "approximately 1157 million dollars (tax 1998 base)." However, it is highly inappropriate to discuss the unit cost for the B-2 because of the small number built. It is reasonable to debate on the unit costs of the F-104 (2536 built), of the F-16 (3779 built), for example, but for the B-2 there are only 21 built, and it simply does not make any sense to argue that the B-2 has "something more" to it because of this unit cost. Actually, it has "something less:" the number of B-2 actually built; this implies that the equipment, infrastructures, logistics, training material etc generate unusually high costs per unit. Also very expensive: the maintenance of its radar waves absorbing surface, and all the costs of its updates. The high costs of B-2 is due obviously to certain new characteristics which have necessitated new research in new directions, but these innovations do not relate to magnetohydrodynamics: they are its system of electronic flight control, a necessity due to the aerodynamically odd features of the aircraft whose shape is not conceived for piloting rationale but for avoidance of radar waves, which impacts negatively the aerodynamic requirements. The high costs are also due to R & D for the stealth concept such as the special paints, special jet exhausts etc. The cost of B-2 is not more exorbitant than that of other planes such as the B-1. It is expensive, but not so much so that that it necessarily implicates that it must benefit of a propulsion method other than that of other planes equally or more expensive and which are jets altogether. In no case I do not support that a propulsion system acting directly by canceling the force of gravitation could not exist, or would be "forbidden by the laws of physics." I submit that it is plain silly to imagine that it cannot exist simply because we have not yet carried out yet such aeronautical prowess in the mere 80 years of aeronautic development we have. Also presumptuous and contradicted by the history of human inventions is the idea that our incapacity at one time to reach out a certain goal has anything to do with "laws of physics" which would be established once and for all, immutable and final. The laws of physics are certainly immutable, but we have certainly not a complete knowledge of them, and nobody should be naive enough as to think we have now listed and understood everything there is to understand. However, just because something is not impossible does not make it an existing achievement; here, the "explanations" provided to a B-2 with antigravity are only copies of same "explanations" given by others in connection with alleged captured UFOs at Area 51. These explanations started essentially with a story by Bob Lazar, who claimed to have worked in a secret place on a recovered flying saucer. These explanations did not stand very well a close scrutiny by UFO researchers, and the least which one can say is that the story of Bob Lazar is far from having convinced the researchers who investigated on it. It is not sufficient to say that element 115 is the secret of antigravitation; it is also not sufficient to say that this is "known since a certain time" by "technicians of the Black world." Such vague statements hardly have any value. There seems to be no evidence at all, not even eyewitness testimony of the alleged B-2 gravity control. Finally I want to add that the magazine Jayne's Defense Weekly also published now and then articles by Nick Cook taking up the idea that B-2 would directly control gravity. You may want to read some indications on the nature of the "investigations" by Nick Cook ici. Its cost is too high for a "normal" aircraft. A video footage shows the air being ionized by its MHD system. With engines on its upper surface, it becomes detectable by satellites. It is abnormal that such a costly aircraft really is unable to fly above the speed of sound. "The B-2 is too expensive to be a normal aircraft, so it must use MHD." However, it is highly inappropriate to discuss the unit cost for the B-2 because of the small number of units. It is reasonable to debate on the unit costs of the F-104 (2536 built), of the F-16 (3779 built), for example, but for the B-2 there are only 21 built, and it simply does not make any sense to argue that the B-2 has "something more" to it because of this unit cost. Actually, it has "something less:" the number of B-2 actually built; this implies that the equipment, infrastructures, logistics, training material etc generate unusually high costs per unit. Also very expensive: the maintenance of its radar waves absorbing surface, and all the costs of its updates. The B-2 alleged MHD video. "A video clip by its manufacturer shows its MHD propulsion at work: a glary fog surrounds it, and this is ionized air, and effect of MHD." The video is almost an advertising clip, freely downloadable on its manufacturer Northrop-Grumman web site, which does not fit very well the notion of a secret MHD propulsion system. ...or... the color is just due to the setting sun. It is important to note that in this video clip the aircraft precisely flies above water, the wet air strongly supporting the appearance of the cavitation phenomenon, and that the phenomenon appears as a sphere extending on the lower part and the top part of the aircraft while an MHS system should also ionize the air on the front of the aircraft where the shock wave of a supersonic flight would have to be fought. Those who have some interest in aeronautics have seen this phenomenon quite often around all sorts of planes, also around the space shuttle. It is not at all a rare phenomenon; it is a frequent and known phenomenon. A particularly interesting point here is that this phenomenon occurs when the plane is flying high subsonic speed, which is maximum speed for B-2. Some pilots even play with the phenomenon, the game is to accelerate and slow down around this speed limit for the pleasure of seeing the vapor cloud caused by cavitation move along the structure of the plane. What may seem to be ionization of the air by MHD is a well-known effect which can be observed with other planes: it is called cavitation, it displays as a ball of vapor around the planes, particularly in wet air. "If it used jet engines, even with the exhausts above the structure, undetectable of the ground, the satellites would locate it by its infra-red signature." What really matters is to limit the infra-red signature below the aircraft, because it is this heat signature which interests ground to air missiles available en masse in many countries with which the United States could be in conflict. The B-2 being subsonic, the limitation of ground detectable signature is particularly welcome. Between the risks to be detected from the ground or from above, the choice is quickly made; these risks are lessened by placing the exhaust above the structure and by masking them as much as possible. But essentially, if there were really a requirement to avoid the detection by satellites rather than to avoid detection by the ground to air missiles, that would not really provide a strong reason to conclude that B-2 would "consequently" use MHD propulsion. It is because it is subsonic that it is particularly vulnerable to ground-to-air missiles; this is why th exhausts are above and not under the aircraft. "An airplane of such a nature cannot possibly be subsonic." One of the reasons given to estimate that the B-2 is supersonic is that for such an expensive, unconventional, strange, stunning plane, it is strange that it would be unable to fly faster. Actually, the concept which governed its realization is that the plane must escape electronic detection; for that, the idea was to make it undetectable, a solution for survival in combat which is different that mere speed. The search for speed is one way of attempting combat survival, the stealthyness is another way. Both ways do not go along very well on the same plane. 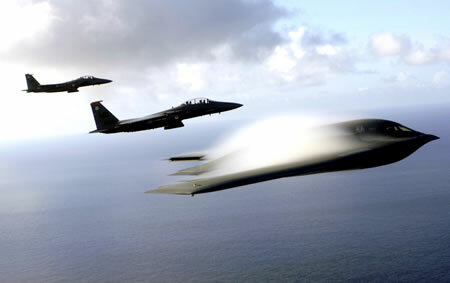 The requirements for stealth diminishes the suitability of the plane for speed. The B-2 was at the beginning, at the time of the Cold war, foreseen as a strategic bomber ready to infiltrate on enemy territory without being detected by the radars. This was meant to be achieved by its particular shape, its low aspect ration, by its special radar wave absorbing paint, but obviously also by long low altitude flight, as radar perform poorly on low flying targets slipping between hills and mountains. The emphasis was put on low altitude flight between natural obstacles, not on high flying speed. The US Air Force already had a supersonic solution for strategic bombing: the B-1. But it seemed obvious that B-1 even slipping by at Mach II was relatively vulnerable radar and anti-aircraft missiles during its long flight above a well defended ennemy territory. 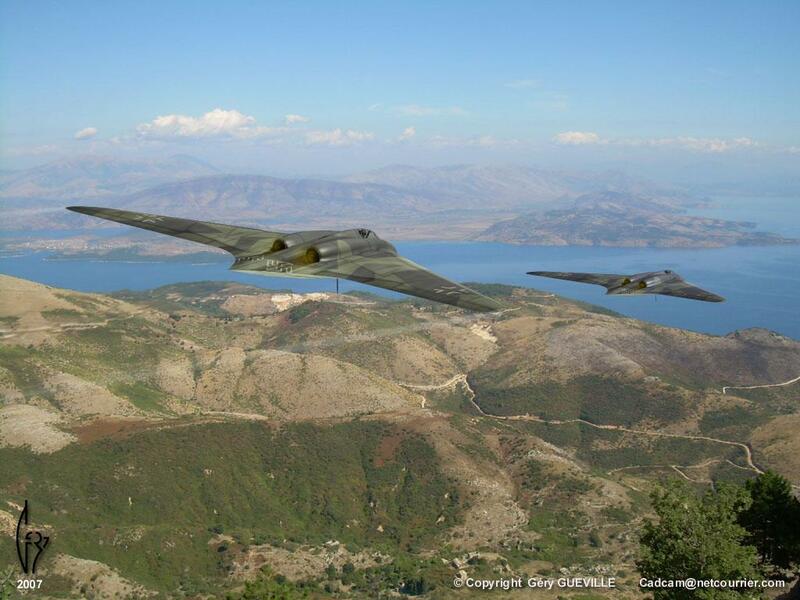 B-2 was thus a complementary concept: low altitude, indetectability instead of high speed. What happens is that at low altitudes, there is almost not even any supersonic jet capable of supersonic speed; the air is too dense. The fast jets are supersonic at high altitude, or supersonic during dogfight with the enemy over short durations, but can certainly not fly for hours at low altitude at supersonic speed. It also uses too much kerosene, and a bomber is not a good tanker, it should carry bombs not fuel. The Cold War is over, the B-2 is not anymore relevant as a strategic bomber; it is now actually used like tactical bomber: its advantage in this field is to be able to approach the tactical targets and bomb them with great precision, avoiding detection by the enemy radars. There is no necessity to be supersonic, even less to be hypersonic. The B-2 concept was never based on speed; it rests entirely on the stealth features. In the above discussion, I give my arguments for the question "does the B-2 use magnetohydrodynamics (MHD) to get supersonic performances." I find this unlikely. But that does not imply at all that the US military have no interest in MHD. As soon as 1960, Northrop was looking into it, i.e. to check if an ionization of the ambient air by a flying machine could have some interest, and he found out that it has. This field of research was dubbed "electroaerodynamic." This research was not classified, but it seems to not exist anymore now, which suggests that either it has become operational or feasible, or that it has been completely abandoned. The 1960 experiments were only experiments using models in wind tunnel; there has been absolutely no operational aircraft. The principle was to saturate the nose of the model with negative electric charges, and to blow air at supersonic speed in the wind tunnel towards the fixed model. It was then actually noted that this drastically reduced the shock wave. These experiments continue at least in the United States: 16 meters long wind tunnels, of a diameter of a few inches, air velocity up to Mach 25 allow testing of the effects of the ionization of models, as for example at the Polytechnic Institute Rensselaer, State of New York. It should however be well understood that the flying machines tested are small models of a few ten grams; that should not at all authorize fairy tales to explain 50 years of observations of UFOS as "secret MHD aircraft." These results have been since 1960 the pure and simple confirmation of what the French physicist Jean-Pierre Petit proposed: good ionization of the air by a flying machine could almost completely eliminate the formation of a shock wave for aircraft flying at supersonic speeds, and thus, the argument suggesting that the reports of supersonic UFOS without sonic booms are "impossible, contrary to the law of physics" was not a good point any longer. Jean Pierre Petit had thus cleverly solved this problem, not by calling upon some "technology yet to be invented" but indeed using a current, though certainly innovative concept, certainly a concept that may become ordinary over a few hundreds years to come and thus also possible on some more advanced planet. He goes without saying that if one admits a consideration that UFOS may sometimes be of extraterrestrial origin, one could also suggest that they regulate these non-problems of "impossibility according to the laws of physics" by other techniques of which we would not have the slightest notion. That seems even a requirement, insofar that in space there is no air to ionize whatsoever. Unfortunately for Jean-Pierre Petit, it seems that this sort of ideas have a little too much "genius" to be acceptable in the military or civil French research. In addition this suggests that the hyper-swift torpedoes or perhaps other underwater weapons mentioned by Jean Pierre Petit may really exist. Concerning possible American flying machines inspired by reverse-engineering of recovered UFOs using the MHD as method of propulsion and not simply as shock wave reduction method, please refer to the work of Jean-Pierre Petit given in reference; the subject is vast and I want to limit this article to the B-2 discussion. Let me simply add simply that MHD as propulsion method makes sense only in an ionizable atmosphere, and that it could be a useful by-product of an unknown spaceflight technique using some unknown field of forces. The A12 was intended to be a subsonic highly stealthy strike aircraft aimed at replacing both the US Navy's A-6 Intruders and USAF's F-111s. The A-12 was cancelled in 1991 allegedly because of cost overruns and the reduction in tension caused by the end of the Cold War and the break-up of the Soviet Union. Although at least $2 billion, and perhaps as much as $4 billion, was spent on the A-12, no hardware has been seen for the money. Yet, it is one of many US avionics project which was used by skeptics to incorrectly dismiss UFO observations. The A-12 proved to be the most troubled of the new American stealth aircraft in large part because of problems found in the extensive use of composites in its structure. These composites did not result in anticipated weight savings, and some structural elements had to be replaced with heavier metal components. The weight of each aircraft exceeded 30 tons, 30% over design specification, and close to the limits that could be accommodated on aircraft carriers. On 7 January 1991, Secretary of Defense Richard Cheney cancelled the program, in the largest contract termination in DoD history. By one estimate the A-12 had become so expensive that it would have consumed up 70 percent of the Navy's aircraft budget within three years. At first blush, the A-12's performance capabilities would have been in roughly the same class as existing aircraft. The key improvement over existing aircraft, not inherently obvious when comparing specifications, was stealth. A real size model of the General Dynamics / McDonnell Douglas A-12 Avenger II was shown to the public for the first time on June 29 & 30, 1996, at the Carswell JRB Open House in Fort Worth, Texas. The A-12 was never finished. The pictures you see in this page are of a full scale model, built out of wood, not an actual operational prototype. The famous "Black Triangle" ufos do not match the looks of the A12. The general shape is not the same, the size is not the same, the color is not the same, the texture is not the same, the lights under the "Black Triangle" type of ufo do not match with anything on the A-12. The only common feature is the global triangle shape as seen from a top view, if you disregard the testimonies who make clear that the black triangle ufos have cut edges. The performances of the A12 have nothing to do with the performances of "Black Trianle" ufos as measured by radar on several occasions. The A12 cannot hover, or fly at the speed of a bicycle at 50 meters altitude, or have 40G acceleration when chased. The "Black Triangle" ufos appear sometimes over cities of countries such as Belgium, or near civilian airports, or in agricultural countryside of Mexico. A secret aircraft of the US would never be sent in such era. This is also the position of the USAF and US Navy. The interest of "stealth" aircraft such as the A-12 is to escape radar detection. On the contrary, "Black Triangle" ufos and other types of ufos are detected by military radars of numerous countries, this is what lead them to take the ufo topic seriously, since radar recordings are physical evidences. General Dynamics Corporation, Fort Worth, Texas. McDonnell Aircraft Company, St. Louis, Missouri (a Division of McDonnell Douglas Corporation). Two seat, two engine, carrier-based medium fighter for air-to-air or air-to-ground all weather day or night attack. Two General Electric F412-400 non-afterburning turbofan engines, each developing approximately 13,000 pounds of thrust. Up to two AIM-120 Advanced Medium Range Air-to-Air Missiles (AMRAAM). Planned to accommodate a full range of air-to-ground ordnance including the MK 82 and "smart" weapons. IBM Mission Control Computer with VHSIC (Very High Speed Integrated Circuit) technology. Kaiser wide field of view holographic Head Up Display (HUD). Kaiser Multifunction Display (MFD) screens (7). General Electric IRSTS (Infrared Search and Track System). AN/ALD-I I ESM (Electronic Surveillance Module) set. The A-12 program was cancelled by the Department of Defense on 5 January 1991. Black helicopters have been reported recently in the US, sometimes associated to UFO observations or cattle mutilation. These helicopters have generated a mystery in themselves: the have no identification marks, are they flown by the US military? Are they secret helicopters? Do they even exist, or are they only hoaxes? Black helicopters do exist, they have no identification marks, and they are not that secret. A source who wished to remain anonymous sent me these pictures. The craft shown here is the successor of the Argus, the Northrop Grumman Ryan model 379 VTUAV, a small size helicopter... without a pilot! The craft is in use by the US Navy for example, they do publish the same photographs on their web site, accompanied with all the technical data. This kind of unmanned crafts are intensively developed and tested by the US military in the recent years, and will probably be deployed for operational use between 2000 and 2025, depending on budget considerations. As these crafts generally have no identification marks, they might -or might not- be the famous "black helicopters". Due to their small size, they might appear to the naive observer as "UFO manoeuvering at high speed in the distance". But on the other hand, they are not at all silent, and you can be confident that tests of such crafts are not conducted over populated areas but rather over isolated dedicated test ranges. These crafts are also quite recent: there was no informatics capacities in the last decades to get an aircraft of any kind to fly in a stable manner under no human control. In few words, when a flying device is observed near a military test range these days, it is more and more difficult to discriminate between human or possibly non-human crafts. But such craft cannot be used to dismiss cases of the past decades, particularly if the UFO case is reported as "unexplained" by the military themselves. The outside world uses the name Aurora because a censor's slip let it appear below the SR-71 Blackbird and U-2 in the 1985 Pentagon budget request. Even if this was the actual name of the project, it would have by now been changed after being compromised in such a manner. The plane's real name has been kept a secret along with its existence. This is not unfamiliar though, the F-117a stealth fighter was kept a secret for over ten years after its first pre-production test flight. The project is what is technically known as a Special Access Program (SAP). More often, such projects are referred to as "black programs". So what was the first sign of the existence of such an aircraft? On 6 March 1990, one of the United States Air Force's Lockheed SR-71 Blackbird spyplanes shattered the official air speed record from Los Angeles to Washington's Dulles Airport. There, a brief ceremony marked the end of the SR-71's operational career. Officially, the SR-71 was being retired to save the $200-$300 million a year it cost to operate the fleet. Some reporters were told the plane had been made redundant by sophisticated spy satellites. But there was one problem, the USAF made no opposition towards the plane's retirement, and congressional attempts to revive the program were discouraged. Never in the history of the USAF had a program been closed without opposition. Aurora is the missing factor to the silent closure of the SR-71 program. Testing such a new radical aircraft brings immense costs and inconvenience, not just in the design and development of a prototype aircraft, but also in providing a secret testing place for aircraft that are obviously different from those the public are aware of. Groom Dry Lake, in the Nevada desert, is home to one of America's elite secret proving grounds. Here is Aurora's most likely test location. Comparing today's Groom Lake with images of the base in the 1970s, it is apparent that many of the larger buildings and hangars were added during the following decade. Also, the Groom Lake test facility has a lake-bed runway that is six miles long, twice as long as the longest normal runways in the United States. The reason for such a long runway is simple: the length of a runway is determined either by the distance an aircraft requires to accelerate to flying speed, or the distance that the aircraft needs to decelerate after landing. That distance is proportional to the speed at which lift-off takes place. Usually, very long runways are designed for aircraft with very high minimum flying speeds, and, as is the case at Edwards AFB, these are aircraft that are optimized for very high maximum speeds. Almost 19,000 feet of the runway at Groom Lake is paved for normal operations. Lockheed's Skunk Works, now the Lockheed Advanced Development Company, is the most likely prime contractor for the Aurora aircraft. Throughout the 1980s, financial analysts concluded that Lockheed had been engaged in several large classified projects. However, they weren't able to identify enough of them to account for the company's income. Technically, the Skunk Works has a unique record of managing large, high-risk programs under an incredible unparalleled secrecy. Even with high-risk projects the company has undertaken, Lockheed has a record of providing what it promises to deliver. By 1945, only a small amount of jets had the capability of reaching speeds of 500mph. In 1960, aircraft that could exceed 1,500mph were going into squadron service. Aircraft capable of 2,000mph were under development and supposed to enter service by 1965. This was a four-fold increase in speed in two decades. From this, the next logical step was to achieve hypersonic speed. The definition of hypersonic isn't as clearly defined as supersonic, but aerodynamicists consider that the hypersonic realm starts when the air in front of the vehicle's leading edges "stagnates": a band of air is trapped, unable to flow around the vehicle, and reaches extremely high pressures and temperatures. The edge of the hypersonic regime lies at a speed of roughly one mile per second - 3,600mph or Mach 5.4. What is regarded by many as the most successful experimental aircraft program in USAF history, the X-15 rocketplane was created in response to a requirement issued by NASA (then NACA) for an air-launched manned research vehicle with a maximum speed of more than Mach 6 and a maximum altitude of more than fifty miles. The X-15 program, which involved three test aircraft, went on to exceed all goals set and provided valuable data which has been used on many high speed/altitude aircraft of today, including NASA spacecraft, and most likely, the Aurora aircraft. In the early 1960s, Lockheed and the USAF Flight Dynamics Laboratory began a hypersonic research program which would provide data on travel at hypersonic speed as well as more efficient shapes for hypersonic vehicles. From this program came the FDL-5 research vehicle, which beared an amazing resemblance to the North Sea Aurora sighting of Chris Gibson. Building on both the FDL-5 Project and Aurora, the aircraft which may have been seen over the North Sea could have been Northrop's A-17 stealth attack plane. There are three reasons why the North Sea sketch drawn by Chris Gibson is the most persuasive rendition of the Aurora vehicle. Firstly, the observer's qualifications, with which he couldn't identify the aircraft; which would have been instantaneous if the aircraft was known to the "white world". Second is the fact that the North Sea aircraft corresponds almost perfectly in shape and size to hypersonic aircraft studies carried out by McDonnell Douglas and the USAF during the 1970s and 1980s. The third factor is that the North Sea aircraft looks unlike anything else. No aircraft other than a high-supersonic vehicle, or a test aircraft for such a vehicle, has ever been built or studied with a similiar planform. At hypersonic speeds, traditional aerodynamic design gives way to aero-thermodynamic design. In order for a hypersonic vehicle to remain structurally intact at such high speeds and stresses, the vehicle must produce minimum drag and be free of design features that give rise to concentrations of heat. The aircraft design must be able to spread the heat over the surface of the structure. Thermal management is critical to high-speed aircraft, especially hypersonic vehicles. Skin friction releases heat energy into the aircraft and must be pumped out again if the vehicle is to have any endurance. The only way to do this is to heat the fuel before it enters the engine, and dump the heat through the exhaust. On a hypersonic vehicle, thermal management is very critical, the cooling capacity of the fuel must be used carefully and efficiently or else the range and endurance of the aircraft will be limited by heating rather than the actual fuel tank capacity. So how will an aircraft reach such speeds? Conventional turbojet engines won't be able to handle the incoming airstreams at such speeds, they can barely handle transonic speeds. In the case of hypersonic propulsion, an aero-thermodynamic duct, or ramjet, is the only engine proven to work efficiently at such speeds. Even ramjets have drawbacks though, such as drag created in the process of slowing down and compressing a Mach 6 airstream. To make a ramjet engine efficient is to spread the air over the entire length of the body. In a hypersonic ramjet aircraft, the entire underside of the forward body acts as a ramp that compresses the air, and the entire underside of the tail is an exhaust nozzle. So much air underneath the aircraft serves another purpose, it keeps the plane up. The ramjets need a large inlet area to provide the high thrust needed for Mach 6 cruise. As a result, the engines occupy a large area beneath vehicle and the need to accomodate a large quantity of fuel means that an all-body shape is most feasible. Structurally, the all-body shape is highly efficient. As well as being extremely aerodynamic, the average cross-sectional area being very large provides a great deal of space for load, equipment and fuel. This being inside a structure that is light and compact having a relatively small surface area to generate frictional drag. Choosing the right type of fuel is crucial to the success of Aurora. Because various sections of the craft will reach cruising-speed temperatures ranging from 1,000 degrees fahrenheit to more than 1,400 degrees fahrenheit, its fuel must both provide energy for the engines and act as a structural coolant extracting destructive heat from the plane's surface. At hypersonic speeds, even exotic kerosene such as the special high-flashpoint JP-7 fuel used by the SR-71 Blackbird can't absorb enough heat. The plausible solution is cryogenic fuel. The best possibilities are methane and hydrogen. Liquid hydrogen provides more than three times as much energy and absorbs six times more heat per pound than any other fuel. The downfall is its low density, which means larger fuel tanks, a larger airframe and more drag. While liquid hydrogen is the fuel of choice for spacelaunch vehicles that accelerate quickly out of the atmosphere, studies have shown that liquid methane is better for an aircraft cruising at Mach 5 to Mach 7. Methane is widely available, provides more energy than jet fuels, and can absorb five times as much heat as kerosene. Compared with liquid hydrogen, it is three times denser and easier to handle. On 16 November 1998, a camcorder video was taken of a mysterious "fireball" in the sky. While this was very interesting, what was even more amazing was the aircraft which was seen shortly after flying at very high speed producing the mysterious "donuts-on-a-rope" contrails. Does this video, which is currently undergoing intense study at JPL, show the mysterious Aurora spyplane? A newspaper article about this event was also written in the The Sun Herald newspaper. The following message was sent by e-mail from the person who recorded it. home in Port Charlotte, FL. video is real; but what the objects are I cant say.